WRS Info India Pvt. Ltd. I have always enjoyed writing. Expressing my self through written words is something that comes naturally to me. 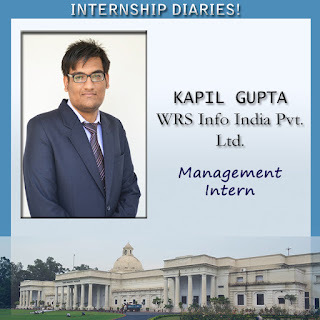 I recently stepped into the world of website content writing with my internship at WRS Info India Pvt. Ltd. My work profile included developing content and designing social media marketing campaigns for their website deal4loans.com. Thanks to a pool of articles that I did over my internship and my super co-operative colleagues, I was slowly able to adapt myself to the methods of how online content writing and content marketing is done. Website content writing is not an easy job. It requires loads of creativity, patience and devotion to learn. At the same time, flunking deadlines is not an option. Further, the finished job needs to be crisp, informative and interesting. So, content writing is a gigantic job but is extremely fulfilling if you enjoy what you write. If you are serious about what you do, there is a lot to learn. I learned a lot about SEO (Search Engine Optimization), SMO (Social Media Optimization), blogging and Content marketing. It is to be understood as doing business is becoming easier thanks to the Internet, online copy-writing has a very important role to play. However a word of caution- copy-writing is not facile and at times can also get really boring, especially when the products/services you write about are very dry, like in my case: loans and insurance policies. In advertising convincingly about all these services through your content, lie the skills of a good copywriter. It is to be understood that the road to content writing is no easy path. It requires a lot of brainstorming. A lot of research needs to be done on the company and business markets. But, the most difficult part is coming up with ideas. It takes a toll on your grey cells to come up with good ideas worth writing for and that are in sync with your company's mission and strategy. Anyone can write but not all can come up with ideas. Now that is what distinguishes other writers from copywriters. 1. Play around with the words: Avoid using everyday words; show a little knowledge of the English dictionary. 2. Emphasize on certain keywords: This along with catching the reader's attention will also help in search engine optimization (SEO) which will maximize the volume or quality of traffic to your web site from search engines. 3. Be Concise and Clear: Do not beat around the bush. Don't make the work ambiguous, it will lead to you losing the customer. Your idea should easily reach consumer's head. Provide attractive material in a short span which stimulates the consumer to do more research. 4. Stick to one Chief component: It is very easy to overthink the process and make your work useless. Too many ideas in one article will blemish your work. Let the reader follow one theme at a time. Do not confuse him. 5. Proofread: Double check what you have written. Be sure of the grammar and language used. Business jargons may not be effective as your customers will not understand them. Other Project: Apart from all the content writing, in my last week I developed a calculator on excel as a part of my project. This calculator can be called a future loan eligibility calculator and provides estimation based on your current career path, as to when you’ll be able to fulfil your dreams of owning your dream house, car etc. In all my internship was a great learning experience. I learned a lot about loan and insurance markets and developed some good quality content over the period of 2 months.